Decorating your bathroom with the best toilet paper holder ideas is now easier than before. You can use some of these new ideas to add some uniqueness to your bathroom. If you have ever tried to use toilet paper without the toilet paper holder, you know that it can easily bounce and pop out of your hands and gets dirty. You will not want to use this toilet paper roll once you’ve seen what happened to it. Keep your toilet paper sanitary by using the best toilet paper holder ideas. Install the toilet paper holder in the best location for using which will be easy to reach it and also far of getting dirty. 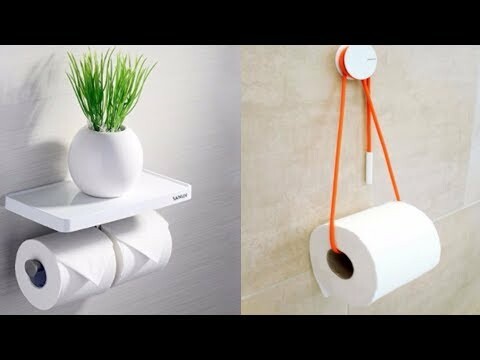 If you did not find a toilet paper holder that matches the decor of your bathroom, you can use one of the new, unique, and best toilet paper holder ideas. Your bathroom is an essential part of the house. You must choose its decoration very carefully like the rest of the house. The toilet paper holder will get a lot of use and abuse, so you should check that your installation is working and will keep up. We offer you the best toilet paper holder ideas that clearly will encourage the creative designs in your toilets. This kind of toilet paper holder is made of fabric and plastic it is pleasant to look at and touch, it is stable and reliable when using, and it is resistant to moisture. This kind of doll is designed specifically as creative design to make a change in your bathroom. The perfect height of the doll in the sitting position is 35 cm. It is possible to use in any color of your choice! You can use a toilet paper holder in the shape of a weightlifter. It will surprise your visitors and give a funny touch to your bathroom. A little music will always add relax to the atmosphere, so if you decided to use this kind of toilet paper holder you will guarantee to have a pleasant bathroom in your house. Using this kind of toilet paper holder will be as if you are saying to your visitors, Smile! You are in an amazing bathroom. This unusual and very stylish toilet paper holder will make your guests laugh before using it every time. Certainly, this toilet paper holder will go perfectly in the toilets of a country house or a Farmhouse bathroom for example. Is your son too old to play with dinosaurs? You can use an old toy of a dinosaur as a toilet paper holder this way you will give that dinosaur toy a second useful job. Do you have another old skateboard in the garage? You can use this bright idea to recycle old skateboard. Take off the wheels, and add a roller to use as a toilet paper holder. And now, your toilet holder has never been so cool. you can use this video to make an easy toilet paper holder.